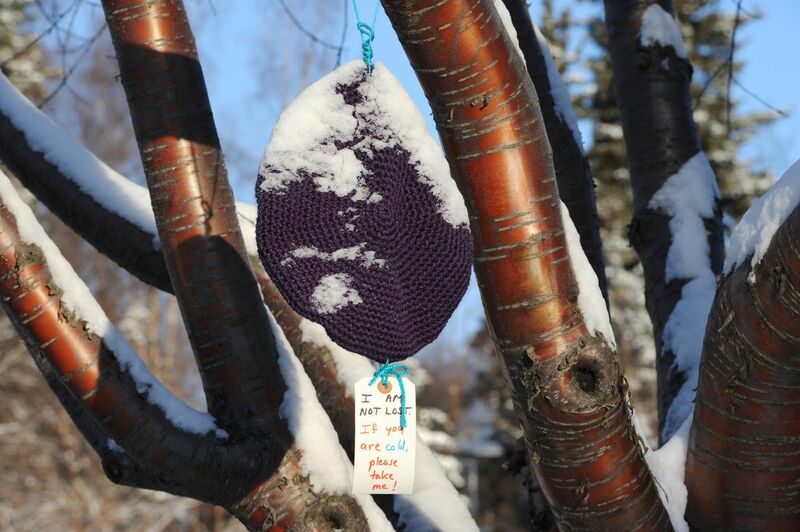 Colorful knitted scarves and hats decorated the branches of trees near Valley of the Moon Park in Anchorage last week, with handwritten tags asking for a new home. "I am not lost," the tags read. "If you are cold, please take me!" The hand-knit items came from Knitters of the North, an Anchorage-based knitting guild with about two dozen members. 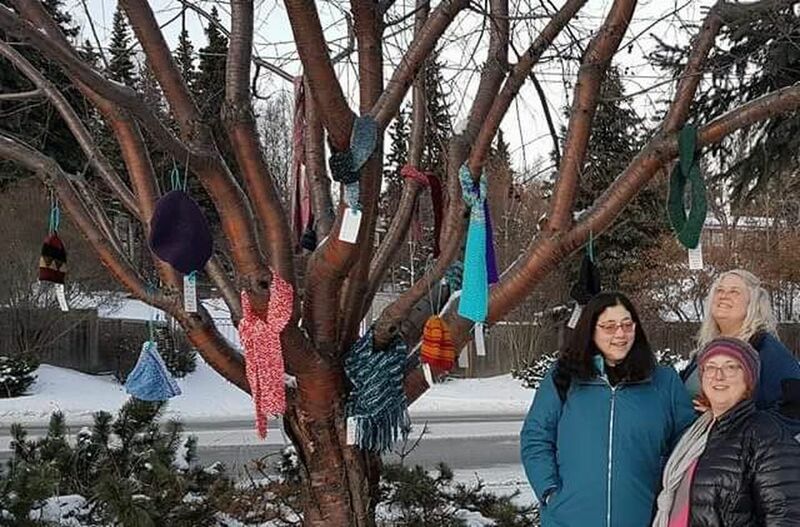 It's a spin on the "yarn-bombing" that other groups have done around the city; knitters wrapped yarn around trees at the Anchorage Museum in February 2015 and on the Coastal Trail last year to brighten up the landscape. During an online discussion about the best use for all that yarn, one longtime member of Knitters of the North, Sara Maurer, got an idea. Couldn't yarn-bombing deliver hats and scarves to people who need them? With approval from her guild, Maurer began to collect hand-knit pieces. She also gave the city parks department a call. She wanted permission to use city trees. Her first idea was the Delaney Park Strip near downtown Anchorage. But Maurer soon decided on Valley of the Moon Park. The park, she learned, was closer to homeless camps and people seeking winter shelter. On the second Saturday in November, after the guild's monthly meeting, Maurer went to the park with the group's president, Margaret Peterson, and a third member, Amy Whinston. The women brought 20 scarves and about a dozen hats, made by Knitters of the North. They placed them in trees that bordered the sidewalk next to the Valley of the Moon parking lot. The "I am not lost" tags told park maintenance workers the purpose of the items. Maurer, who has been in the group 15 years, imagined people who were sleeping outside would take a hat or scarf. But really, she said, the items were for anybody who was cold. "It is a way people can help themselves and not feel like they're asking for a handout," Maurer said. A few days later, Peterson, the guild president, drove by with a friend to show what they'd done. At that moment, a young man was walking by. He wasn't wearing a hat or gloves. He paused at the tree and read the labels on the scarves. He took two of the scarves, put them on, and kept walking, Peterson said. He looked like a college student. Last Friday, when Peterson went back to take pictures, just about five items remained. "I was amazed. In one week, it was picked over pretty good," Peterson said. "That made us so happy." Like other knitting, sewing and quilting groups in Anchorage, Knitters of the North have taken on a variety of charity projects, from shawls for residents of the Pioneer Home to clothing for homeless youth at Covenant House to cotton knitted bandages to be sent overseas. Whenever someone has an idea for a project, the group is supportive, Maurer said. Maurer said she hopes to repeat the project next year. "People say, 'There's so much bad in the world. There's nothing I can do to change it,'" Maurer said. "But think if each person would do one nice thing a day — as simple as holding a door and smiling." Corrections: An earlier version of this story misspelled Sara Maurer's last name and misstated the number of items that were made. Because of an editing error, it also incorrectly stated that Knitters of the North participated in "yarn-bombing" trees.